From interview to induction and far beyond, school leaders should prioritise the professional development of TAs in order to improve learning outcomes for all pupils. In this short post, I intend to try and draw together previous thoughts on teaching assistants and the impact they can have. Along the way I will highlight exciting new resources from which SENCOs can take some new strategies to try in school. Even in today’s circumstances, the recruitment of TAs is something well worth investing in; good, enthusiastic staff can make a massive difference to learning outcomes. I have written more extensively about this in the past, but as we enter another recruitment phase I’m reminded of how important it is to find the right people for the roles you need. It’s vital that you are clear and transparent when it comes to setting out expectations for the role, through a job description for example. This would include details of any personal care you would expect a TA to carry out. The last thing you want is to create any misperceptions if you’re hoping for the right candidates. Offering a clear support and development program is also important, not only to attract the right candidates initially, but equally to ensure you take the role as seriously as you would expect of the TAs themselves. Make sure your TAs have access to good quality training, evidence-based learning strategies and opportunities to work in partnership with the teacher and other professionals. Opportunities to understand language and communication needs, and other areas of specific interest, will ensure that your TAs are not only developing their personal skills, but evolving within the role. A ‘vested interest’ in professional development can have a significant additional impact upon the young people and their outcomes in the shorter term. There has been a lot of work over the last five years or so with regard to the effective deployment of TAs. I have looked more closely at evidence-based ‘best-bets’ for deployment, and these are still very much ‘current’ and worth exploring as timetables ‘settle’ and your understanding of the pupil population develops. Measuring the impact of support staff on learning outcomes should be a key concern for SENCOs. 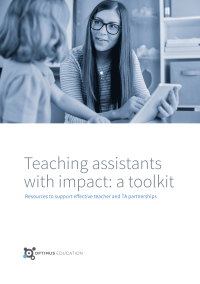 Optimus has recently produced a free booklet that provides a range of useful resources to support the effective use of teaching assistants, and a stronger working partnership between teacher and TA. If you are, or know a new SENCO, teacher or TA who is looking to get off to the best possible start this month, or even a more experienced colleague, rethinking your approach, this excellent new resource will have something for you to take away. Download your copy of our new resource pack for teachers and TAs, Teaching assistants with impact: a toolkit. The 30-page booklet features contributions from Gareth, Anita Devi, Natalie Packer, Elizabeth Burns, Ruchi Sabharwal and Maureen Nash.